On a gusty night in Grafton visiting Avon Lake defeated Midview 4-0. The Shoremen took control of the game early despite playing into a strong headwind during the first half. In the 3rd minute junior Spencer Chippi found senior Edison Lemanowicz at the near post off a corner kick but his redirection was saved. Shortly after Lemanowicz received the ball on the left and hit a hard left footed shot that barely missed over. 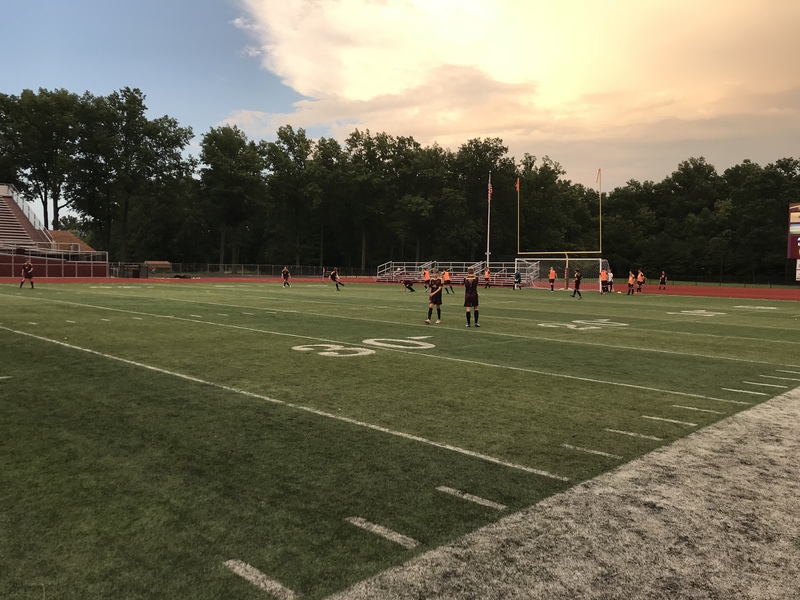 Avon Lake would score the first goal in the 7th minute after Lemanowicz won a ball off a Midview defender near the left corner and played a short pass to junior Drew DelGiudice, who did the rest by beating his defender along the end line and then popping the ball past the keeper. Avon Lake nearly added another in the 15th minute after a ball from senior Michael Mandel found Lemanowicz in space on the left. He beat his man and served a ball that went through the 6 yard box that senior Cam Salco almost latched on to at the back post but he could not quite get there. A similar situation unfolded in the 33rd minute as junior Danny Lambert got to the end line on the right and served a quality ball through the box that sophomore Zach Ramsey almost got to at the back post. DelGiudice hit a lovely cross from right to left in the 37th minute that Ramsey headed on frame to force a reaction save from Midview’s goalie. The rebound bounced to sophomore Liam Reutter but his volley attempt from close range sailed over. The halftime score was 1-0 Avon Lake, but with the wind at their backs in the second half more opportunities would soon come. In the 44th minute senior Joey Caputo picked off a pass and dribbled forward before finding Lemanowicz running on the right flank. He cut it back and played a through ball up the middle that enticed the goalie to come off his line, but DelGiudice beat him to it and touched it by before finishing calmly into the vacated net to make it 2-0. Then in the 45th minute the Shoremen followed up with another goal, this time after senior Andrew Jacobson made a hard run with the ball on the right before feeding Lemanowicz, who juked his defender before breaking in near the end line. His left footed blast beat the keeper and found the far side netting to give the Shoremen a 3 goal cushion. The Middies got a good look in the 48th minute off a quick counter that led to an open shot from distance. The hard shot was on target but freshman keeper Zach Glesius was up to the task leaping to make the save. Immediately after, Salco got the ball and went coast to coast up the left side, but his shot attempt was well saved by Midview’s keeper to keep the score line 3-0. In the 61st minute Lambert found Lemanowicz with a pass to the near post, and he found Reutter but the Middies goalie, who was solid all evening, recovered in time to corral it before it could be turned home. Sophomore Logan Allemeier found Chippi with a through ball from the left side a minute later, and Chippi managed to sneak past the keeper, but his momentum took him away from goal and his cross couldn’t quite make it to Ramsey on the right and it was cleared away. The final Shoremen tally would come in the 76th minute after Jacobson found Ramsey on the right and he dribbled by his man to the end line before delivering a cross that Lemanowicz flicked in to make it 4-0. Lemanowicz’s two goals on the evening give him a team leading 16 and his two assists give him 5 on the year. DelGiudice’s two goals improve his tally to 6 on the year. Jacobson and Ramsey both collected their second assists as well. Midview fought until the end and had a couple of chances in the final moments, including a chance in the box that senior Aidan Miller was able to win and clear, and then a follow up from long range that did not miss by much to the left just before the final whistle. With the final score of 4-0 Avon Lake improves to 12-2-1, 7-1-1 SWC. Unfortunately with an Avon win over Berea Midpark tonight, the Eagles clinched the SWC Championship, edging out the Shoremen by a single point in the standings. The JV Shoremen were also victorious, earning a 5-0 win in the first game off goals from freshman Nate Summerfield (2), and one each from sophomores Logan Allemeier, Tyler Johnson and Ethan Catlin. They move to 10-1-4 on the season. Avon Lake is back in action for their regular season finale, which is also Senior Day, on Saturday October 13th at home against Cleveland Heights, with games at 10am and 12pm.